Habitat: Desert. It often grows in sandy washes. 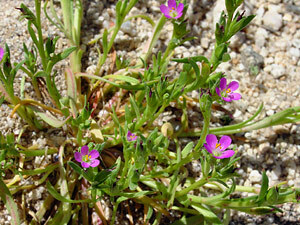 Description: The flowers have 5 round-tipped petals and are 1/2 inch (1.3 cm) wide. 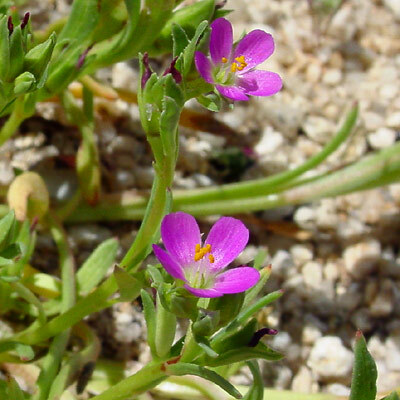 The plants are low-growing and succulent with alternate, lance-shaped, often reddish-tipped leaves. The seeds are shiny and black. Birds and rodents enjoy the seeds. Culturally Significant Plant – Native Americans used the seeds to make flour and oily meal. The young greens were eaten like spinach. Edible – The black seeds and the young greens are edible. The nutritious seeds are high in oil and can be baked and ground into flour. The young greens should be eaten sparingly and cooked to reduce the oxalic acid content.